Action for Happiness Australia is all about bringing people together to explore the latest research on happiness and discuss how we can apply that to our lives to boost our happiness and that of those around us. We do this through events, the Action for Happiness Course "Exploring What Matters", our local groups and Happy Cafes. This 8 week course is a unique and inspiring chance to meet like-minded people and discuss what matters for a happy and meaningful life. The course is based on the latest scientific evidence and is intended for people of all backgrounds, particularly those who would like to see a more positive and caring society. Each session has a theme, based on a 'big question', such as 'What really matters in life?' 'What actually makes us happy?' and 'How should we treat others?' We encourage participants to share their own experiences & learn from each other as well as hearing from experts such as Jon Kabat-Zinn, Brene Brown and Ed Diener. The course was launched by Action for Happiness's patron the Dalai Lama. It is run over 8 sessions, which take place weekly and last for 2 hours. If you are interested in JOINING a course click here. If you are interested in LEADING a course click here. Our vision for the Action for Happiness movement involves local groups of like-minded people joining up to share ideas and take action. By getting together we can inspire and support each other to increase our own happiness and well-being as well as creating a happier society for everyone. We'd love to see groups spreading to every town across Australia - so if there isn't a group near you and you believe that happiness matters, and want to be part of building a happier society, then why not create a local group today and start putting ideas about the science of happiness into practice together. Details on what's involved in running a group and the ground rules can be found at Action for Happiness local groups. If you want to start a group then contact us and we can help. Happy Cafes originated in the UK and are now spreading across Australia. The idea is simple and inspiring: a friendly and welcoming place to meet other people with a shared interest in promoting happiness and wellbeing. 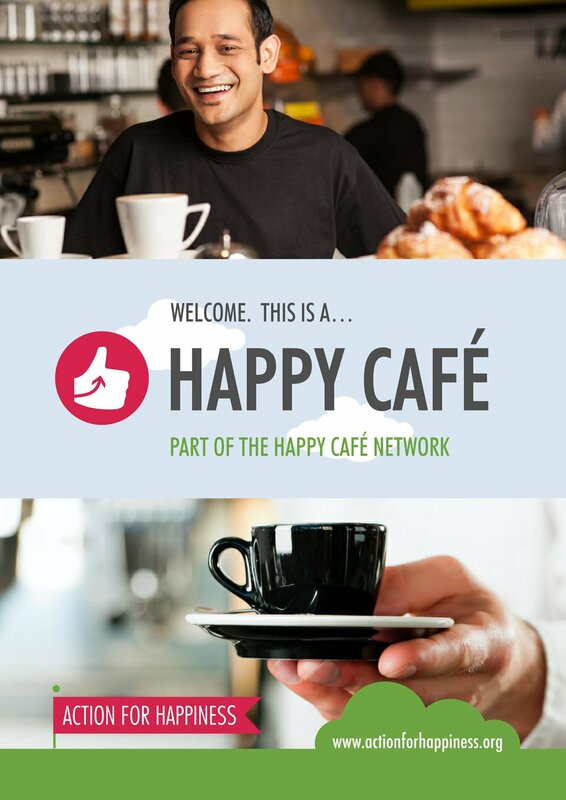 If you'd like to find out more about how you could start a Happy Café near you, please visit http://www.actionforhappiness.org/happy-cafe.